1. In medium bowl, using a fork, mash bananas; whisk in yogurt and peanut butter until smooth. 2.Transfer mixture to large zip-top plastic bag; snip bottom corner with kitchen scissors. Place dog bone- and/or paw-shaped silicone molds on rimmed baking pan; pipe banana mixture into molds. Freeze 6 hours or up to overnight. Makes about 20 pupsicles. 1.In medium bowl, whisk pumpkin, applesauce and dog treats until combined. 2.Transfer mixture to large zip-top plastic bag; snip bottom corner with kitchen scissors. 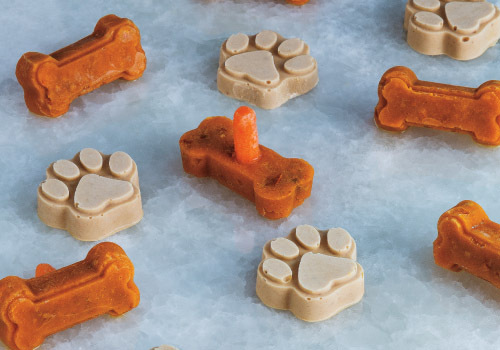 Pipe into ice cube trays or dog bone- and/or paw-shaped silicone molds placed on rimmed baking pan. Freeze 6 hours or up to overnight, sticking a carrot into each cube as the “stick” after 1 hour. Makes about 20 pupsicles. > Avoid xylitol as a sweetener ingredient in your yogurt and peanut butter ingredients as it is extremely toxic to dogs. And, remember that “pupsicles” are a treat so your dog should not consume in excess.